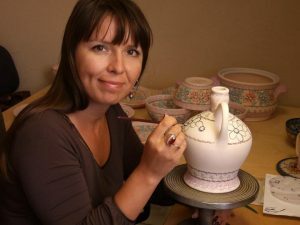 In 2003, in the owner’s hometown – Boleslawiec famous for its centuries-old tradition of pottery making, the idea was born to transform her great passion and love for regional products into business activity. The idea has been implemented and so the family business Artistic Pottery Vena came into being. During the following years, the company located in the former Piast’s Duchy of Brzeg and Legnica, stretching from Boleslawiec, over Legnica and Wroclaw up to Brzeg, kept maintaining the centuries-old traditions of pottery making which go back up to XV century. Since the moment the company was established, it has been drawing on the rich tradition, while at the same time introducing the spirit of modern styles as well as creating unique and remarkable decorative arts. The successive decorations created personally by the owner keep gaining the recognition from both domestic and foreign customers. The fact that our production is characteristic of the regional craft has been attested to us by the National Artistic and Ethnographic Commission in Warsaw. Due to the rapid development and broad investment plans, the company was converted into limited company (ltd) at the beginning of 2009. The uniqueness of our pottery results from the great passion to create things that are functional, while being of the highest artistic quality at the same time. Therefore, all designs and decorations placed on our products have been created with the care to preserve the traditional character of the pottery of the Boleslawiec region and at the same time with the desire to introduce the freshness of styles and colours. In the end, it has resulted in a wide palette of the original and unique decorations we have in our collection. Nowadays, there are over 200 various patterns and over 150 decorations in our offer. The main group of our products consists of ceramic tableware articles. These include among others: plates, bowls, vases, various mugs, containers, pots, pitchers, teapots, cups, dishes and many others. The ceramic accessories produced by us such as vases, Christmas tree decorations, tiny bells, small animals, boxes etc gain recognition as well. 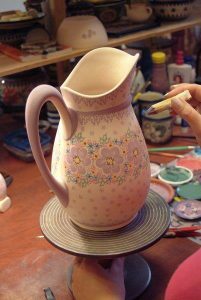 All ceramic articles are shaped by hand and decorated by using the stamp method as well as brush painting. 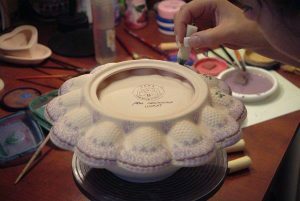 All ceramic decorations are manufactured by using the underglaze method which makes them resistant to wear and tear as well to damage. The pottery production cycle begins with pottery vessels being formed, dried and initially burnt in the temperature of 850oC. The biscuit product we get is painted with ceramic paints, and glazed after that as well as burnt in the temperature of 1250oC. The use of such a high burning temperature brings about that our pottery has beautiful and shiny glaze and is very durable. You can use our pottery to bake in an oven. It can be washed in a dishwasher and used in a microwave. Our ceramics tolerate low temperatures as well, so you can apply it to store food in refrigerators and freezers. Our articles are hugely popular with both domestic and foreign customers. Thanks to vivid export contacts our products reach countries in Western Europe, Asia, North America and the Arabian Peninsula. Domestic and foreign customers can see and buy our products in our sales showrooms in Boleslawiec and Wroclaw as well as in our Internet shop. There is also an opportunity to see and buy our articles at the various industry events such as fairs, exhibitions, national and international shows in which we actively participate.